The Glimmerglass Festival on the shore of Lake Otsego is up and running for its 41st season. A few kilometers away from Cooperstown and the museum that honours people who hit balls with a bat, it provides cultural nourishment, intellectual pleasure and spiritual enrichment for modest people who enjoy opera. You may roll your eyes now. One of this year’s eclectic choices is The Crucible by composer Robert Ward and librettist Bernard Stambler. It gets a superb production conducted by Nicole Paiement and directed by Francesca Zambello. The Crucible is, of course, based on Arthur Miller’s 1953 play that deals directly with the Salem witch trials of 1682 but more cogently with the American witch trials of the 1950’s under Senator McCarthy. Ward and Stambler captured and indeed heightened the dramatic events of the play. Nicole Paiement conducts the Glimmerglass Festival Orchestra in an intense and nuanced performance emphasizing every dramatic chord. The singing is affecting and frequently outstanding if just as frequently uneven. 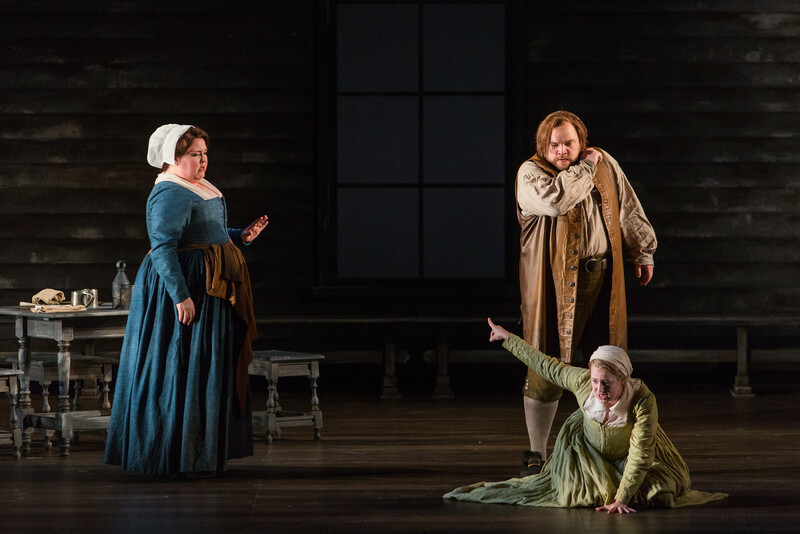 Mezzo-soprano Jamie Barton gave perhaps the best performance as Elizabeth Proctor, a troubled woman who betrays her husband while trying to save him. Her marvelous voice conveyed pathos and she gave us an Elizabeth that we fully sympathized with. A nice combination of vocal beauty and acting ability. Baritone Brian Mulligan has the taxing role of John Proctor, a practical farmer who committed a sin and is caught in the maelstrom of insanity led by a few girls. He is caught up in the vortex of religious fanaticism, vengeance and greed that will lead to his death. In the end he rises to heroic if tragic stature in a fine performance by Mulligan. Tenor Jay Hunter Morris sang the role of the Judge Danforth, the man who arrogates to himself the role of God’s spokesman and Satan detective. Morris may have been having a bad night but he sounded strained at times even though he never failed to be dramatic. 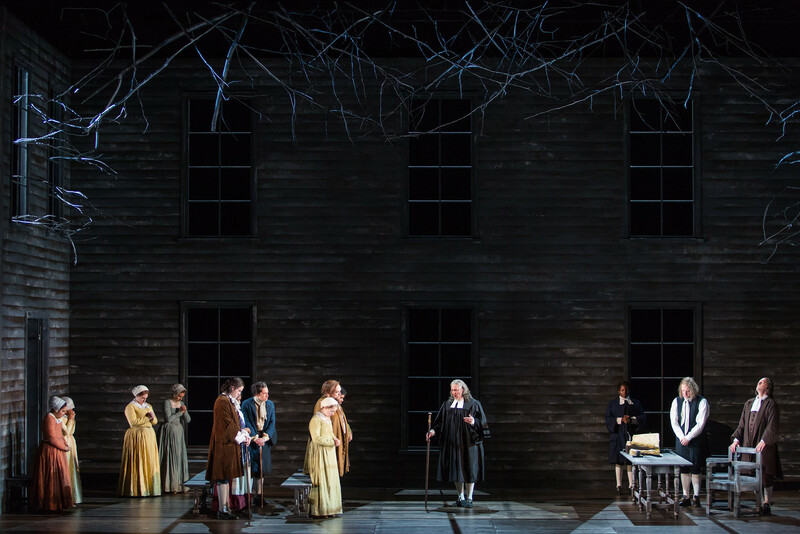 Most of the cast of The Crucible comes from the Festival’s Young Artists program and their performances were overall admirable. Most notable were soprano Ariana Wehr as Abigail Williams, baritone Michael Miller as the nasty Thomas Putnam, mezzo-soprano Helena Brown as Rebecca Nurse, and Maren Weinberger as Mary Warren. Zambello’s production is taut but Spartan. The set by Neil Patel consists of bare gray walls with windows that serves for interior and exterior scenes. The only change is the scene between John Proctor and Abigail where the same gray motif prevails but there is a fallen tree in the background. The staging is done expertly and the drama proceeds to its ultimate climax inexorable and dramatically. A superb night at the opera. And speaking of baseball, some of you American aficionados may wish to acquaint yourselves with opera. The World Series is coming faster than a curve ball and where will you go when the Blue Jays clobber all the American teams? Remember, the lights go down during an opera performance.